With only four days to go until Brighton’s opposition to the far-right nationalist March for England, details are becoming clear. In response to changed information coming from the police, Stop the March for England – the campaign group that has been organising the opposition to the fascist demonstration – has changed the details of the anti-fascist callout. 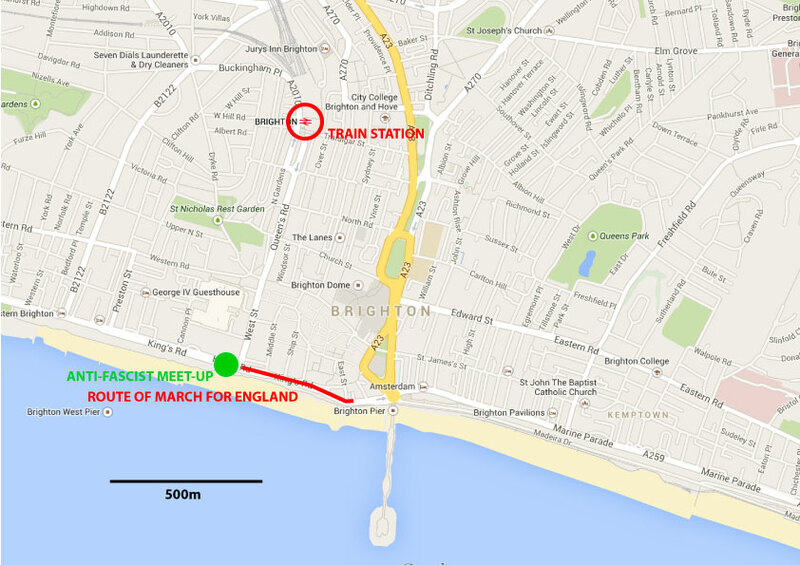 The fascist march will be held in the same location as last year – along a short stretch of the main seafront road. However, the police have announced they are running the route back to front, i.e. starting from the bottom of West Street heading towards the Palace Pier roundabout and then back again rather than the other way around. They are saying the march will start on Kings Rd just east of West St and stop just short of the roundabout so that it will be able to stay open to traffic. The police have also indicated the march will be starting at 12.30pm and should be over by 1.30pm. The section of seafront road between West St. and the roundabout will be closed between 11.00am and 2.00pm. The pavement on the north side of the seafront road will be closed to pedestrians during this time. As you can see on the map all the roads connecting with the seafront road will be blocked. Last year this was with giant mobile metal walls, so we should expect this again. The police designated area for anti-fascist protestors is the pavement on the beach side of the seafront road, as it was last year. Last year this was lined with large squares built of crowd barriers and weighted with ton sacks of sand to keep the two sides apart. Again, we should expect this to be similar to previously. Last year some of the fascists were bussed into and out from the march, but many of them also wandered down through town from the train station in small groups. This year the police are saying no transport will be provided by them, so it is possible that we could see all of the marchers wandering down through town from the station and then back again, although it would be unwise to take everything the police say at face value. As we know from previous years, the actual march is a small part of the total events of the day. Due to pressure from anti-fascists, the march has been gradually squeezed to take up less time and a shorter and shorter distance. However, it is to be expected that there will be fascists hanging around town all day into the evening. The police are also saying that they will be enforcing legislation to make people remove any face coverings, although of course what they actually do on the day depends on what it is practical for them to do. Contact your local AFN group for details of any transport to Brighton.